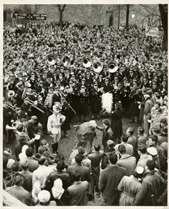 The story behind the 1948 football team's memorable march to Rose Bowl victory. 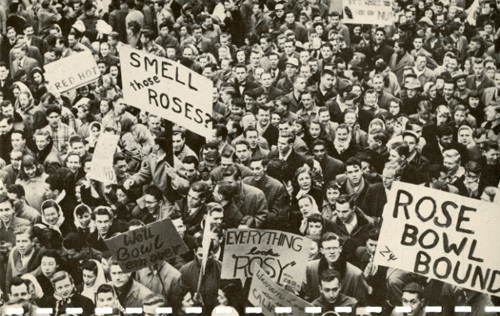 Video: March to the '49 Rose Bowl — Four members of Northwestern's 1949 Rose Bowl–winning team share the story of the Wildcats' history-making win over California. See more videos from Northwestern News. A cloudless Indian summer Saturday. Undefeated Northwestern hosting nationally ranked Michigan State. The setting and the circumstances were perfect for minds to drift back six decades to when the stadium was still called Dyche, the Spartans weren't yet in the same league and the Wildcats carried the Big Nine's hopes to Pasadena. 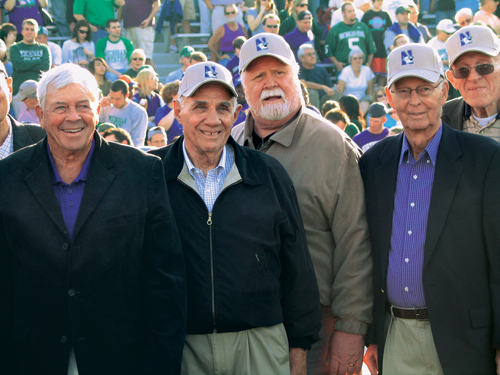 In October almost half of the 45-player roster from the 1949 Rose Bowl team, Northwestern's first bowl team and only bowl winner, returned to Evanston for a 60-year reunion and a halftime tribute. Voigts, a former officer in the U.S. Navy, had a squad anchored by veterans, not just of the gridiron but of World War II. Many of the 'Cats had been in combat and were older, wiser and tougher than the typical student-athlete. As Lawrence "Fatso" Day (EB50), a WWII veteran and Wildcat lineman is quick to point out, junior end Al Thomas (CB50) was awarded a Silver Star, the third-highest honor bestowed by the armed forces. "We were in various services all over the world, really," says Ed Nemeth (C50), a paratrooper for the 101st Airborne Division in Germany who played guard for the Wildcats and still marvels at the group's maturity and camaraderie. "Our guys were so tightly knit and so well-known to each other, we were really like brothers at that time. "When we came to Northwestern we connected almost automatically. You learned how to work together. It worked, believe me." Early in the 1948 season Northwestern confounded the prognosticators and gained national respect. The 'Cats opened with a 19-0 road victory over UCLA and then a second-straight shutout, 21-0 over Purdue at Dyche. Then, after spotting visiting Minnesota 16 points, Northwestern stormed back to win 19-16. As halfback Ed Tunnicliff (C50) recounted in a recent phone interview, "Sarki [Wildcat center Alex Sarkisian (C49), a future College Football Hall of Fame inductee] rallied us. He was not only a great football player but also a great team captain, and we were a team that was going to accomplish things." The following week, the now third-ranked Purple & White traveled to Ann Arbor to face mighty Michigan, defending Western Conference (later known as the Big Ten) and Rose Bowl champion. It turned into the only lopsided blemish on the Wildcats' season, a 28-0 defeat. The Wolverines, in the midst of a second consecutive perfect season, were the only team to score more than 16 points against Northwestern. The 'Cats rebounded with a 48-0 thumping of Syracuse, followed by triumphs of 21-7 over Ohio State and 16-7 at Wisconsin. Northwestern then took on powerhouse Notre Dame in South Bend, and the visitors fell, barely, 12-7. With only a home game left against archrival Illinois, the 'Cats had a 6-2 record and a chance for their first Rose Bowl because conference rules then prohibited teams from going to Pasadena in back-to-back years. Michigan was ineligible to return in '49 after its 49-0 romp for the roses over USC in 1948. On a frigid November day, before 48,000 fans, halfback Frank Aschenbrenner (EB49) led Northwestern to victory over the Illini with 84 yards on 11 carries, including a touchdown. Charles Bartlett's flowery Chicago Tribune game story began with: "Northwestern's Wildcats, a feline football tribe, suddenly turned into horticulturists, yesterday became posy fanciers of the Rose variety as they wrought a 20 to 7 victory over Illinois in the final Western Conference game of the season." Thousands of students paraded around the campus and the streets of Evanston, and a reported 500 more did a snake dance in front of Marshall Field's in downtown Chicago. The giddiness climaxed in the cancellation of classes that ensuing Thanksgiving week. Above the masthead on the Daily Northwestern's front page was "No School! No School! No School!" and just below it was "Roses!" "Everybody was out of their dorms," Day recalls. "We went down to the women's quad, and they put us up on the balcony and had a great time. A lot of cheering, a lot of fun." Northwestern's South Side collegiate neighbors, who had dropped football and left the conference within the previous decade, apparently took a dim view of the hoopla and traveled north to show it. "University of Chicago students came and criticized us for being athletes rather than students," Perricone says. "We weren't in their eyes very intellectual, and they wanted to make sure we knew that." For the first two years of the Rose Bowl's deal to exclusively match teams from the Western and Pacific Coast conferences, the Midwesterners ruled. 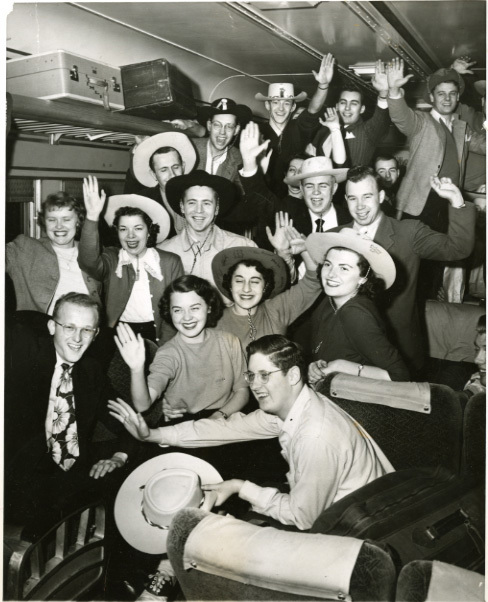 Illinois whipped UCLA 45-14 in 1947 before Michigan's resounding '48 triumph. But New Year's Day of 1949 seemed to portend the end of the trend, as undefeated and explosive California was the opponent for a two-loss team that got in on a technicality. "A lot of people didn't think we belonged in it," Nemeth recalls. "Even the national media felt we didn't have a prayer and were pretty upset we were selected. But the rules were the rules." "All the papers out there and everybody thought that Cal would win," Aschenbrenner said recently by phone. "And Cal had our old coach [Waldorf], so they figured he knew our plays. We were laughing among ourselves at how they were calling us so lousy." When the Wildcats opened their season with the blanking of UCLA, their roundtrip was by plane. This one, with school out of session and a big entourage to bring, was a two-day journey via special train that departed Chicago on Dec. 18. When the 'Cats arrived and conducted their first practice before the watchful West Coast media, the Los Angeles Times reported initial impressions: "Onlookers were amazed by the speed, pep and streamlined appearance of the Wildcats, who had engaged in only five exam-hampered drills since the closing of their regular season." By edict of Voigts, the Northwestern players were to avoid their press clippings, pro or con. "He didn't want us to spend any time reading the newspapers because of all the negativity toward little old Northwestern," says tackle Bill Forman (WCAS50). Regardless, their portrayal as the underdogs was neither a secret nor without effect. "That did an awful lot to get our motors running," says tackle Steve Sawle (EB50). Forman says the team's big-game experiences had the players very upbeat to begin with and Voigts reinforced that as New Year's Day drew near. "He was perhaps more relaxed in California for that game than I had seen him in other situations," Forman says. "He was very cool and confident, and he expressed that to us." Predictions of a mismatch didn't deter paying customers. According to the Dec. 22, 1948, L.A. Times, 3,000 people waited in line all night to buy tickets. The newspaper also said Northwestern had 3,000 alumni on the West Coast, and "all want to be inside the Rose Bowl." Voigts instructed his team not to speak with the press, but that didn't stop stories from flowing freely leading up to the game. The L.A. Times ran a comparison of the 'Cats' set of twin brothers from Mason City, Iowa: guard "Fatso" Day and safety Loran "Pee Wee" Day (SESP50) — Fatso outweighed Pee Wee 215 to 185; Fatso was a lefty, but Pee Wee was a righty; and Pee Wee was married, but Fatso was a bachelor. Newspapers also kept track of the players away from practices and the team hotel, the luxurious Huntington. "They followed us around a great deal, and I won't comment on what they caught us doing," says Forman amid guffaws. But he adds, seconds later, "They published pictures of some of the men having a beer in a bar. I thought that was kind of a low blow at the time and I still do." Perricone explains, "We had an afternoon off. We were in the Brown Derby having a beer, not carousing. We were out a total of an hour-and-a-half, and it was reported much bigger." The out-of-towners received celebrity treatment in other ways. "We went to a play one night and arrived late," says end Burton Keddie (EB51), "so they started the play over." The night before the big game, Keddie says, the whole team attended a Warner Brothers film screening of The Paleface and got to meet its star, Bob Hope. Earlier in the day, Voigts had taken the team through the customary walk-through in the imposing and empty Rose Bowl. As Tunnicliff remembers it, "He said, 'Look around, because I don't want you doing it tomorrow.'" The 35th Rose Bowl pitted one team that averaged 28 points against another that exceeded 21 only once all season and totaled just seven points in road losses to its two toughest opponents. The potent Bears, whose roster had but five non-Californians, had reason to feel supremely secure as they took the field against the Wildcats, who represented 10 states — none on the West Coast, with 18 players from Illinois and 10 from Indiana. One development, however, gave Northwestern a comfort of home. "We were proud of wearing dark jerseys that day because of the flip of a coin," Perrcione says, "and we always seemed to play better when we wore dark jerseys." When the Wildcats entered the stadium filled with 93,000 fans, the atmosphere was "pretty electrifying," says Nemeth. Forman says what comes to mind first about that moment and the whole day is the size and deafening noise of the crowd. As for the challenge Northwestern faced, Fatso Day says, "We weren't a bit afraid. They [the Bears] thought they had a shoo-in, I think." Merely by playing, the Day brothers made history. Pee Wee, who died in 2003, and Fatso are the only pair of twins to compete in a Rose Bowl, according to the Intercollegiate Football Researchers Association. Pee Wee had a first-quarter interception, the first of two for him and four for the Wildcats. Tom Worthington (C50) had the other two — no other team or game in Rose Bowl history has had two players with two interceptions. "I broke the linebacker's tackle after running left," says Aschenbrenner, who gives most of the credit to his blockers. "I was surprised at how it opened up." Nemeth was among the key blockers. "It just happened so quickly. Things fell in place, and when Frank broke loose, he just took off," says Nemeth. "One of the things I think about most often from that game is Frank's TD," says fellow halfback Tunnicliff. "I led his interference, but he cut back. … The last guy who could've caught him didn't see me. "It was nice to come in and nail that guy because he could've nailed Frank." The fans were stunned. "There was total silence from this gigantic crowd," says Forman. "And the silence was overwhelming. No one could believe we scored first." After the touchdown, Nemeth says, "We got in the huddle and one player said, 'Hey boys, this is gonna be easy.' Well, it wasn't. It never was. We got behind." On the Bears' next play from scrimmage, All-America fullback Jackie Jensen, considered by many the best athlete ever at Cal (read more about Jensen in our "'49 Rose Bowl Trivia"), answered with a 67-yard scoring run to make it 7-7. Northwestern's own All-America at fullback, Art Murakowski (SESP51), got the call with the 'Cats on Cal's 1-yard line in the second quarter. "I said, 'Come through between Rudy [Cernoch (SESP51), a tackle] and me. We'll move everybody out, he will be able to score,'" Keddie recalls saying in the huddle. "I promised we'd take him into the end zone." Get into the end zone, Murakowski did, but he fumbled and Cal recovered. The question was — and is — whether Murakowski still had the ball as he got over the goal line. The play remains one of the most controversial in Rose Bowl history. "I was two feet from it, and he scored, no doubt about it," says Sawle. "He had possession when he crossed." "I was right in the middle of the pile," Nemeth says. "When Art took the ball and hit the line, it looked to me like he'd just crossed. He fumbled too late for it to be called." Field judge Jay Berwanger, winner of the first Heisman Trophy in 1935 (read more about Berwanger in our "'49 Rose Bowl Trivia"), saw it the same way and ruled it a touchdown for Northwestern, which missed the extra point but took a 13-7 lead. "California was not in agreement," Nemeth says, "and I don't blame 'em. Art was hit hard, and the ball flew out. There was a lot of doubt." To this day, the Bears rue Northwestern's "phantom" score and the judgment of the legendary Berwanger. "We know Murakowski fumbled the ball before he got to the goal line, and the photo clearly shows that," Cal's Frank Brunk, a fullback and defensive back said in an interview this June with CalSportsDigest.com. "I would just like to hear someone from Northwestern admit it." Forman counters, "The camera doesn't lie, but it has to be at a proper angle to determine how far Murakowski actually ran. There were camera angles that showed it (the touchdown) couldn't possibly happen, and some that showed that it did possibly happen." "Art's feet were not in the end zone," stated the Jan. 2 L.A. Times about its Page One photo of the play in question. "Because of the angle, it is possible part of his body may have been — but the Cals will yelp about this one for a long time to come." According to CalSportsDigest.com, several Bears continue to lobby the Pac-10 Conference (formerly the PCC) and the Rose Bowl committee to put an asterisk in the record book next to the game's final score, because of the disputed touchdown. But Forman, who lives in California, says, "I had friends who played for UC-Berkeley, and for years they'd always give me the business, saying we didn't really beat them. But in the last few years they came around to admit we did beat them." Early in the second half, things really seemed to look up for the 'Cats when Cal's golden boy was sidelined. "We thought we had it made when Jackie Jensen left the game, hurt his leg," says Day. "But they brought in somebody who played a great game." Brunk, Jensen's roommate, replaced him and churned up yardage to set up a go-ahead score with 1:40 left in the third quarter. Trailing 14-13, the 'Cats' chances came down to a desperate drive from their own 12-yard line late in the fourth quarter. It's what remains the game's most vivid memory, says Aschenbrenner. "I think most everybody had given up on us." Whenever it faced adversity, says Sawle, memories of experiences far more threatening unified and emboldened the team. "Tunnicliff was missing a finger from a combat injury [as a tank driver in Germany]. A lot of guys had been shot at. It brought us all together in a way, that bond." Several players also cite their quarterback's humor in the huddle for its calming influence. "Burson was always funny," says guard Bob Nowicki (EB52). Perricone, a short-yardage specialist whose late runs were crucial, says Burson called plays for him on the final drive by saying, "Hi diddle diddle, Perricone up the middle." On the drive's first play, Tunnicliff fumbled and Cal recovered, but Tunnicliff was ruled down before losing the ball. The next play, Aschenbrenner, a halfback, completed Northwestern's only pass of the game in four attempts, an 18-yard reception by end Don Stonesifer (EB51). Perricone then gained 14 yards and later also succeeded on a fourth-down run. Following a hard-fought short gain for Aschenbrenner, Northwestern had the ball on the Cal 43. Wildcat history was about to change forever with a call that drew on the military discipline of its participants and dramatic flair befitting Northwestern's acting program. The 'Cats had practiced but rarely used a trick play in which the snap went through Burson directly to one of the halfbacks, with the other halfback in motion and the fullback decoying as if he'd receive a pitch from Burson. The key was for each man in the backfield and on the line to flawlessly engage in the deception and delay the defense from recognizing who had the ball and where the play was going, and then to execute their blocks. "We had to be in the three-point stance and not telegraph anything," says Tunnicliff, the right halfback at the time. Tunnicliff had already been called upon 10 times, averaging six yards a carry. Now came the "secret play" with the ball to go to him for an 11th time. Aschenbrenner, the left halfback who had 11 carries for 119 yards and also excelled as the punter and a kick returner, says, "I was really winded, and we were closer to the sideline on my side — he [Burson] called Tunny, and I was happy. It was a good call." Tunnicliff told the L.A. Times: "When Don Burson called it in the huddle, I could have kissed him." The ball was snapped through Burson's legs to Tunnicliff, Nemeth recalls. "[He] took the ball and put it behind him and stood there for a moment and the play made off as if it was going around the left end, and the defense started to follow 'em, and we on the line took a step in that direction, which drew 'em, and Tunnicliff took off around the right end, and the line just swung around this way and set up a wall, so to speak, before they could recover, and he went right down the line. "There were some pretty good blocks," says Nemeth. "Some of the players didn't realize he broke loose." "Big Bill Forman left his feet," back Johnny Miller (C51) says, "and that block was the key to the win." As Forman recalls, "I was a left tackle lining up outside the right end. The ball was snapped and I took two or three steps to the right and headed directly toward the goal line where a man was standing, and it was a very simple maneuver — I took him out," he says with a laugh. "That's what I remember." As Tunnicliff sprinted toward the goal line, "I knew Cal's Frank Brunk would hit me — he jumped on my back at the 7-yard line," Tunnicliff says of the defender who significantly outweighed him. "My reaction was, 'I'm going to get to that goal line if I have to carry the whole stadium.'" Tunnicliff's touchdown gave the 'Cats a 20-14 lead with under three minutes left. "I didn't realize Tunnicliff had broken free and scored," says Keddie, "I thought maybe it'd been mishandled. I was scared to death from the roar of the crowd." "I don't think that California was looking for any sort of razzle-dazzle from the Northwestern team," Forman says. "We played a very conservative running game." But Waldorf, the future College Hall of Fame coach, said in news accounts, "We practiced against the Tunnicliff play, but it happened anyway." Cal mounted a serious last-ditch drive of its own. "If Pee Wee Day hadn't intercepted [inside the 10-yard line]," Aschenbrenner says, "they could've won, as their fullback [Brunk] was raising hell." Fittingly, the defense saved the day to wrap up a season in which only Michigan scored more than 16 points against Northwestern. Not to be overlooked, says Fatso Day, was the second line of defense. "We had great linebackers: Ray Wietecha [SESP51] played with the Giants for years and George Sundheim [C51], who was as good a tackler as I've ever seen and could hit harder than anybody, and of course, Sarkisian." 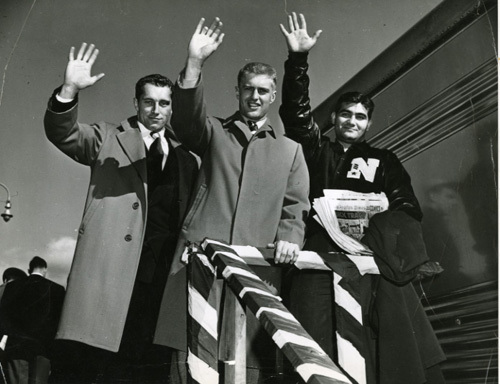 Three players, says Perricone, made the '49 Rose Bowl champs special. "Frank Aschenbrenner, Alex Sarkisian and Art Murakowski — they were all older, profound leaders, unbelievable football players. … The rest of us were journeymen compared with those three." The Chicago Tribune paid tribute to Northwestern's relentless ground attack that compiled 273 yards: "… remember the terrific running of the Wildcat backs, those lads were not stopping until stopped, period." Aschenbrenner was named MVP of the game and later inducted into the Rose Bowl Hall of Fame. He lives in Arizona and says he rarely misses attending a Rose Bowl. For the coach who left Northwestern for Cal, this was the first of three straight Rose Bowls, all tight losses for his Bears. "Waldorf came into the locker room after the game to congratulate us and he said, 'I knew that today I could not lose,'" says Sawle. The celebration for the victors continued after they left the West Coast. "Oh God, that was a blast," Sawle says of the train trip home. "A two-day, two-night party. It was part of the experience and a great way to wind down." Northwestern's marching band was supposed to arrive in Chicago ahead of the returning players, but its train, which took a Northern route, was caught in a snowstorm in Cheyenne, Wyo. 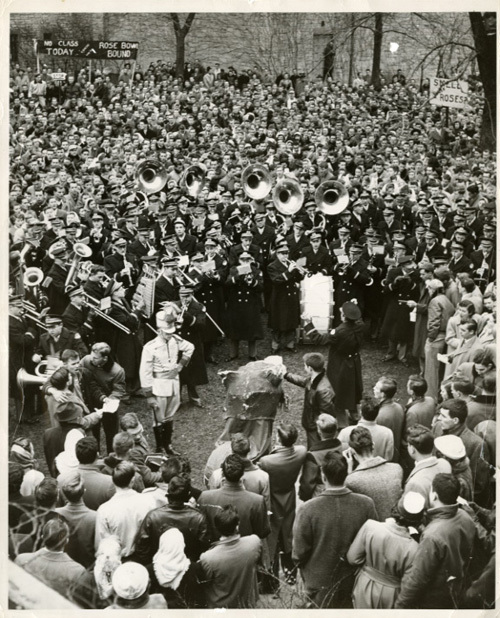 Instead of the band welcoming back the team, players greeted the 144-member band after its unscheduled snow-driven holiday out West. "Before we went there (to the Rose Bowl), we were told, 'You'll remember this your whole life,'" says Day, "and you do, and it's a lot more pleasant because we won the game." With a beaming smile and a fragile scrapbook, Day brought several members of his family to this October's 60th anniversary gathering. The retellings and reminiscences render crumbling pages irrelevant as those who were there and others far younger share in the lore of the '49 Rose Bowl champions. "This reunion's better than the last one," Sawle says. "The stories get better. The time is precious." As Forman holds court with sons and grandsons in the reunion hotel lobby, one of his boys proudly wears a T-shirt with a black and white photo of Forman airborne, parallel to the Rose Bowl turf, about to take out the defender on Tunnicliff's game-winning touchdown. At another end of the lobby, Sawle says to Keddie, "Do you ever look at the pictures of all of that and pinch yourself? I do. It was all so wonderful." William Weinbaum (J82, GJ83) is a New York City–based producer for ESPN-TV and contributor to ESPN.com. 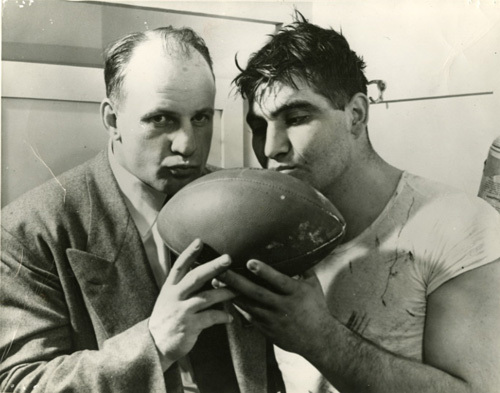 University Archives has more than 2,000 reels of film of Northwestern football games from between 1929 and 1989, including the 1949 Rose Bowl, in its collection. To view additional football highlights and game programs, visit University Archives.